Tonight I am going to a scrapbooking night with some girlfriends. Now the problem is not finding photos to use, but WHICH photos to use. I have so many pre-digital. I have decided to do some from back in 1990 when my ex - Paul, Son - Shane, Daughter - Rachel and myself were traveling through Europe on our way back to Australia after 5 years away. Oh what memories they have created, some good, some bad. The trip was wonderful but we had our car broken into in Milan and all of our clothes and lots of other stuff taken. Looking back on it I guess it added to the excitement, but we could have done without that excitement. One of my most favorite place would have to have been Venice, I could have just stayed their forever. 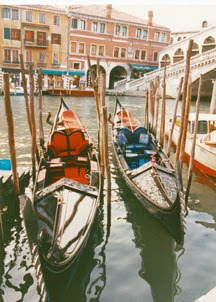 We did all the touristy stuff including a romantic cruise in a Gondola - with a soon to be ex and two kids!!!! ** "Davine Time" update - doing some scrapbooking. It sounds like quite the vacation! Hope you have fun with your scrapbooking venture! Darlene- It definately a trip of a lifetime - 2 months of just traveling thru Europe. I loved Venice too! This got me wondering where my Venice pics are. I'm off to find them. Oh some day I hope to go to Venice! !